Bose® Professional offers a broad set of enhancements to its ControlSpace® product line, greatly expanding functionality for system integrators and end users alike. Several new ControlSpace features are tied in with Audinate’s Dante™ protocol, which has been strengthening its status as a new industry standard. The ControlSpace ecosystem now includes a wider range of networkable DSPs, power amplifiers, and new Dante endpoints; the ESP-1600 engineered sound processor; the free downloadable ControlSpace Remote app, allowing end-user control from Android™ and iOS mobile devices; and new features added to ControlSpace Designer™ software version 4.3. More easily create Dante solutions for new and retrofit installed audio applications. Configure complete Dante networks from within ControlSpace Designer software, including control, monitoring and audio routing. Utilize ControlSpace Dante endpoints with PoE anywhere analog devices need to be converted to Dante, thereby minimizing analog cabling and taking advantage of existing network cable. Provide control over small or large systems via recallable Dante subscriptions using ControlSpace Designer software. Provide end-user benefit through the offering of ControlSpace Remote, an installer-configurable tool to aid with easy remote control of sound system now available for mobile devices. The ControlSpace ESP-1600 extends the line of Bose fixed-I/O engineered sound processors with a new model designed for up to 16 analog inputs. The ESP-1600 features a built-in ESPLink output for sending eight digital audio channels to one or more PowerMatch amplifiers and when combined with a Dante card, the ESP-1600 becomes a powerful, high-quality and cost effective input processor (e.g. stage box) for Dante network distribution. ControlSpace Dante endpoints (EP22-D, EP40-D, WP22B-D and WP22BU-D) complement the ControlSpace ESP products and the PowerMatch line and share configuration and control using ControlSpace Designer software. 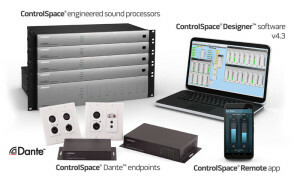 Available in wall-box and rack/wall-mount versions enabling installation in various locations (surface, table, shelf, rack), Bose ControlSpace Dante endpoints are the most convenient and cost-effective method for connecting analog devices like microphones and mixer amps. ControlSpace Remote, is an installer-configured mobile device app, designed specifically for end-user wireless control using Android™ and iOS mobile devices. ControlSpace Remote is a free download on the Google Play™ store and the App Store, which the installer can integrate into new or existing installations where networked Bose system electronics are in use. The newly released version 4.3 of Bose ControlSpace Designer software is now available to download on http://pro.Bose.com. Remote administration capability, providing the ability to update, monitor, and change system designs offsite. New “custom” option for mixers, routers, and source selectors allowing the user to specify the exact block size they require. Integrated programming for two new Audio-Technica Dante microphone solutions: ATND971 Dante-enabled cardioid condenser boundary microphone and the ATND8677 Dante-enabled microphone desk stand. New Hardware Manager feature streamlines system setup by placing network and device setup in one central control element. Text labels, input/output labels, and other minor enhancements to make designs simpler and easier to follow.